How to Open and Play IFO files? Can You Rip 4k Blu-ray with MakeMKV? If you have gotten a bunch of files including IFO, VOB and BUP files, then you have DVD-Video files. These are the files directly from a DVD movie. How do you open and play the IFO files? There are a variety of ways to play these files. However, some solutions are less suited than others. Everybody really should have some form of software DVD player installed. We have found the best ways to play IFO files, you can choose one you like. Everybody really should have some form of software DVD player installed. You can install the DVD player software which can play the IFO files smoothly, like the VLC, Quicktime, KMPlayer, you can choose one and install on your PC,we recommend some of them for you. 5KPlayer is an all-in-one DVD Player Software is designed to play any DVD (DVD disc, ISO image, VIDEO_TS) on Windows 10 (64 bit and 32 bit), 8.1, 8, 7, etc. With no ads, malware or spyware. It’s one of the best Windows DVD player software. Undoubtedly, VLC Media Player is one of the most popular DVD player software for Windows. It supports a wide range of Windows operating systems, and already has a basic Windows 10 support. As powerful as 5KPlayer, it is able to play DVD discs, DVD folders as well as ISO files. To play a DVD disc with VLC Media Player, open the File menu, choose Open Disc from the resultant menu item. KMPlayer, also known as K-Multimedia Player or KMP, is a free DVD player for Windows. Just like other software, it contains its own internal codecs making it possible to play virtually every media file available including DVDs. In addition, it offers many advanced features, is extremely customizable, and is available in multiple languages. You can choose another way to play IFO file: Convert IFO to other popular video formats which can be played happily, for example: You can convert the IFO to MP4, AVI, MOV, MKV, etc, they all can be wide used by the media player. Especiall the MP4 video which can be acceptable by the Windows Media player, Quicktime, VLC, etc. You just need one IFO video converter, like Pavtube Video Converter Ultimate which works on Windows and Mac OS well, including the latest Windows 10 and macOS High Sierra. This video converter not only allows you to import the IFO files, you also can load the ISO images, DVD disc, Blu-ray disc to it, at the same time, this software can remove the DVD and Blu-ray file protection, like the Lionsgate DVD, DVD region code, DVD CSS, UOPs, etc. You can choose any video formats from the IFO, 300+ video formats are here, in addition, you can choose the 3D videos for various VR headsets, like Samsung Gear VR, PS VR, Oculus Rift DK2 , etc. Step 1. Free download Windows or Mac DVD ripper, install and launch it. You can click the "File">"Load from discs" to add the DVD or Blu-ray disc, you also can drag the IFO file to this software directly. 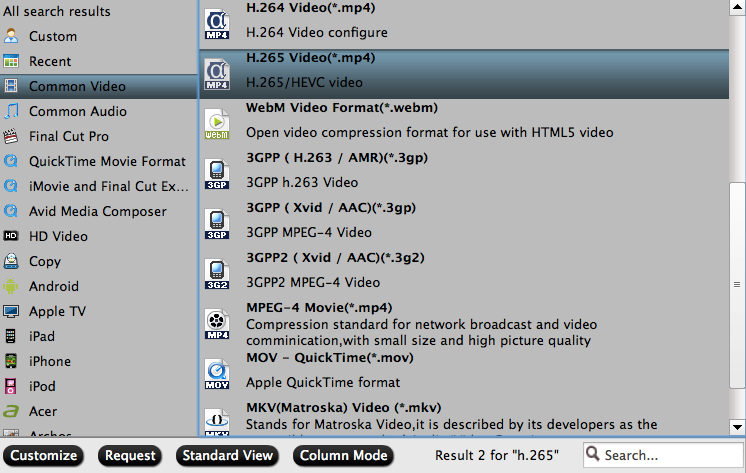 By the way, you can add the folder which holds many IFO files, you can do the batch video conversion. Step 2. Click the Format button and choose the video format you need, you can convert the IFO Files to MP4 in H.265/H.264, then you can enjoy the 30x faster speed than other common video converter. If you just want to play IFO on Windows computer, you can simply choose the Windows Media Player supported video formats like WMV, MP4 as the output format by following "Format">"Common Video"/"HD Video". 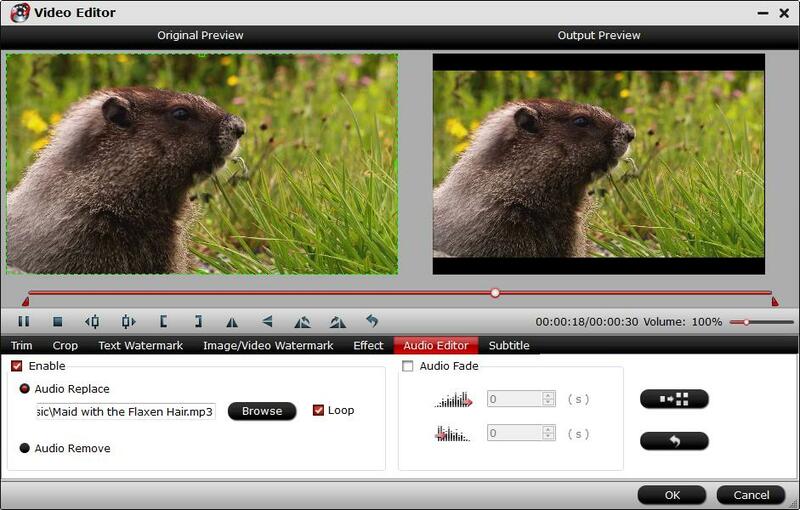 If necessary, you can click "Settings" to adjust video/audio parameters, including bit rate, sample rate, channels, etc. If you are satisfied with the video formats, you also can keep all the video settings. 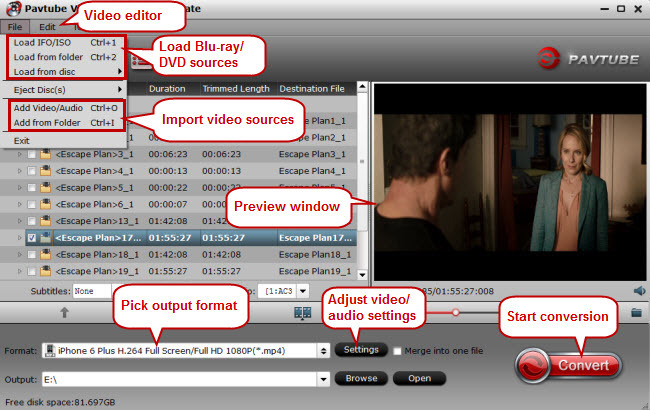 You also can press "Edit" button to customize output files with provided practical video editing features, including: trim video length, crop video size, split large video into segments, add watermarks, adjust video effect. Step 3. Hit "Convert" button to start IFO video conversion on Windows or Mac. Wait for a while, you can get the desired video file, then you can play it on any media player you want. VOB: VOB stands for DVD Video Object. It is basically one of the core files found on DVD-Video discs and contains the actual movie data, including an MPEG-2 video stream and support audio (MP2, AC3, DTS etc.) In order to view stand-alone VOB files, you need to have a DVD player software that supports VOB playback. IFO: In video editing, IFO normally refers to a file on DVD-Video disc and stands for InFOrmation. IFO files basically contain all the information a DVD player needs to know about a DVD so that the user can navigate and play everything properly. BUP: BUP files are simply backup copies of IFO files on a DVD-Video disc in case of corruption. How to Play MOV File on Windows 10?